Most insulation testers are susceptible to damage when testing insulation resistance while voltage is being measured. The 7015IN has a unique feature which senses voltage on a measured object and will switch to voltage detection mode. This prevents damage while testing. 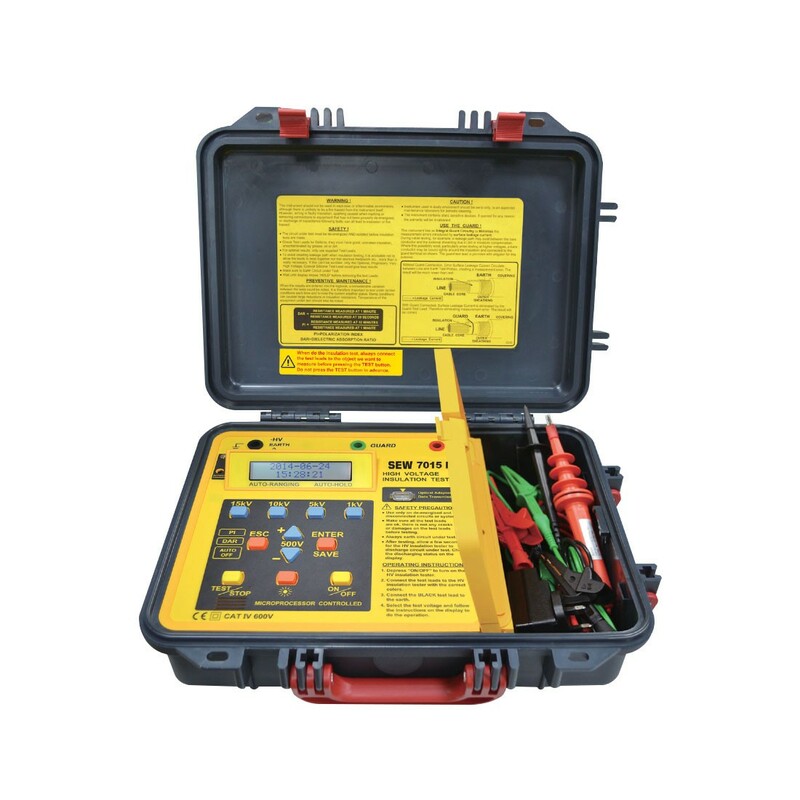 The LCD display and intuitive menu lets you easily test 30 different voltages: 500V to 15kV. The Dielectric Absorption Ratio, Polarization, and volts can be downloaded and saved to a PC or transferred for a large real time display using a laptop. The combination of features and price may it hard to beat. Test Voltage: 500VDC to 15kVDC adjustable in 500V Steps. Presets: 1kV, 5kV, 10kV, 15kV. Insulation Resistance: 70GΩ at 0.5lV and 2TΩ at 15kV. Accuracy: (5% Reading + 5 Digits). Voltmeter: 0-600VAC, 0-600VDC (±2% Reading + 3 Digits). Operating Temperature: 0ºC to 40ºC / 32ºF to 104ºF. Power: Rechargeable Battery with AC Adapter. Safety: EN61010-1 CAT IV 600V, EN61010-2-030, EN61326-1. 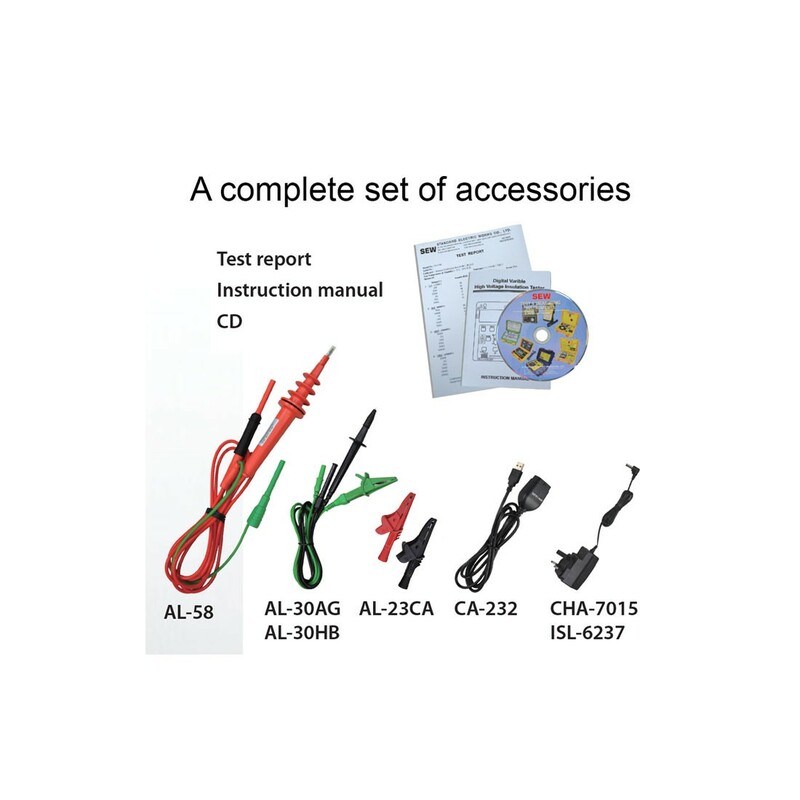 Included: Manual, Test Leads, Data Cable RS-232/USB, CD, Alligator Clips, Charger, Test Certificate to a Recognized Lab.